My inexpensive candelabra is in pretty good condition after I cleaned it up yesterday and it doesn't need any repair work - probably from being protected by the layer of 10 year old dust and candle wax! And now comes the fun part of dressing it up a bit. I don't want to go too over the top but I want to add a bit of sparkle to it. So it's straight to my stash to find something with a bit of bling and what I've pulled out is a few strands of AB finish clear glass beads. 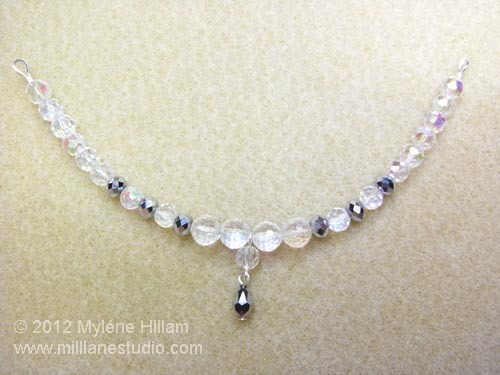 I would love to be using real crystals for this but I don't have enough in my stash and when I padded it out with the glass it cheapened the whole thing, so I'm sticking to the glass only. 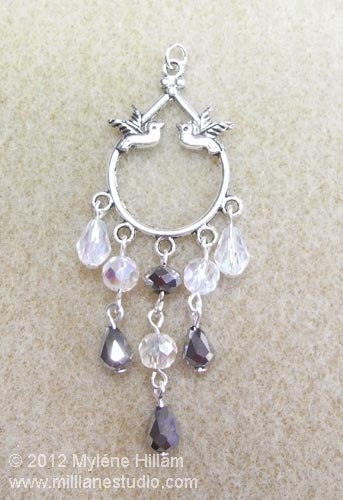 I also chose some silver chandelier components which have birds on them that will work quite well with the theme. 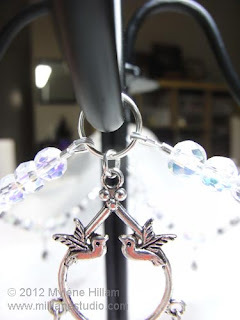 You only need to know how to turn a simple loop to make these chandeliers. 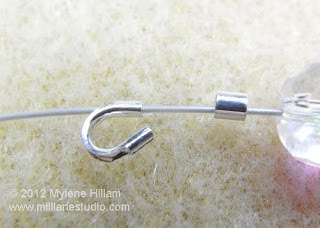 Firstly, thread all the tear drops onto head pins and turn a simple loop. 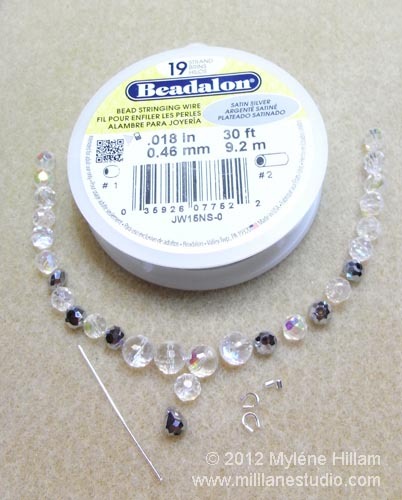 Thread the remaining beads on eye pins. 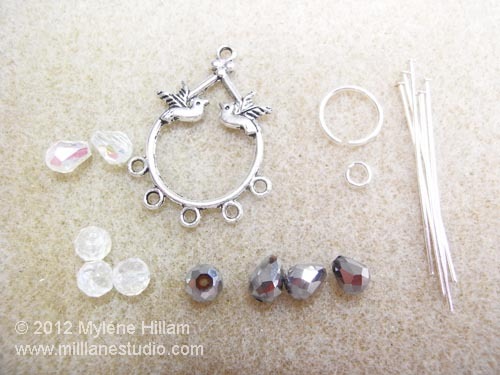 I've used the ends I cut off my head pins to create the eye pins but if you don't want to do that then add four eye pins to the materials you'll need. Connect all the loops to each other and you're done. Easy! 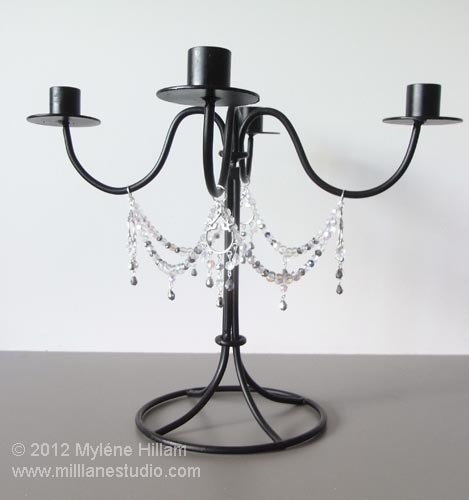 You'll need one chandelier component for each arm of your candelabra and maybe an extra pair to turn into matching earrings! 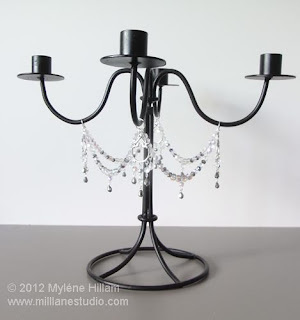 You'll need to add a jump ring to each chandelier so that it sits straight when it's connected to the candelabra. Now it needs some beads draped between its branches. For this part of the project you'll need to use a crimping tool and beading wire. I'm using Beadalon 19 strand beading wire (.018") in Satin Silver and number 2 crimp tubes. This wire will allow the beads to drape gracefully. 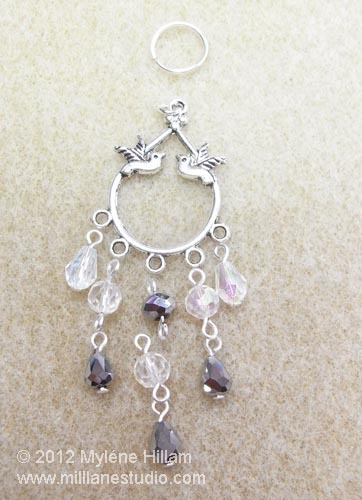 Start by creating a dangling component using the head pin in the same way as you did for the chandelier component, using a round bead and the mirrored silver teardrop. 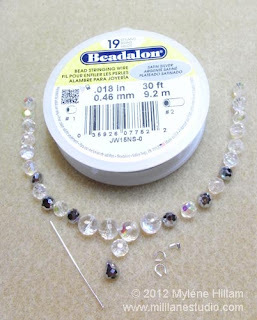 Thread on all the beads following the pattern above, placing the dangle component in the middle. Add a crimp tube followed by a wire guardian. Thread the beading wire through the other side of the wire guardian and then crimp the tube making sure the wire does not cross over itself. 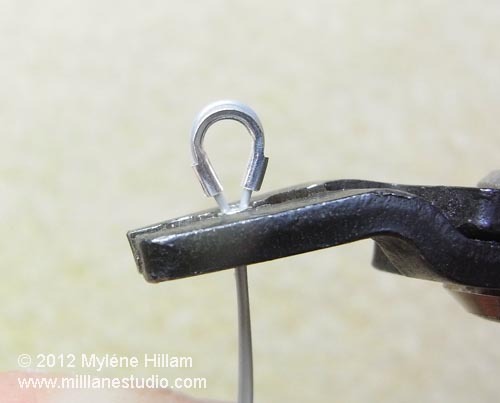 Complete the crimp by laying it sideways in the top hole of the crimping pliers to crimp the wings into the middle. You'll need one of these drapes for each arm of the candelabra. Attach a 10mm jump ring to each arm and hook on a strand of breads, a chandelier component and another strand of beads. Connect each strand to the arm next to it so that it drapes gracefully. And the finishing touch? Well I think that I might just go over the top after all. The cups of the candle holders are looking at me begging me to decorate them. Will I? Or won't I? What do you think? Should I or shouldn't I? This was another budget project and I was fortunate to have all the components on hand. But if you'd like to make your own, all my supplies have come from Feeling Inspired with the exception of the silver mirrored tear drops which I picked up at Michaels. More party instalments to come soon. Hope you'll stop by again to see what's next. I think it's beautiful. I'd be tempted to put a ring of beads around each of the candle holder cups. I'm looking forward to seeing pics of everything together. Thanks Cate. I was thinking the same thing - a ring of beads could look wonderful! I REALLY love what you've done with this!!!! Looks much better now that all the old wax has been stripped away and it has some shimmer again! If I'd known it would be so easy to clean that wax away I would have done it years ago! I might even leave the beads on there - they match the mirrored mosaic vase!